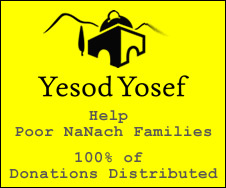 Na Nach Nachma Nachman Meuman: Hafatza getting stronger and stronger B"H.
Hafatza getting stronger and stronger B"H.
Recently our great Nanach friend A.P. may H"Y bless him and protect him, printed 2000 copies of Kitzur Likutay Moharan, and almost instantly gave them all out for free! He is now about to do the same, B"H, with the holy book Hishtapchus Hanefesh.